God's Value System develops the theology of understanding God and biblical issues in terms of relationship with God. Jesus never intended the Gospel to be something that only affected life after death. His message of good news begins right now in this life. An inadequate understanding of the Gospel fails to bring the values of Christ's Kingdom into our lives. However, a true understanding of the relational blessings that God provides for us brings transformation to all of our relationships. As you read this book, you will refocus your attention on what Jesus taught about his Kingdom, and what he declared to be good news. Relationships are based on what you have in common with another person, whether family, work, hobbies, or religion. Truly knowing a person, including God, is entirely dependent on knowing what that person values; and deepening relationship requires agreement and unity in what you value most. In order to have a good and meaningful relationship with someone, you must hold in common that which is most important to you. This is no different in our relationship with God. Relationship with God must be based on our adopting values that are like his, and removing from our lives anything we value that he does not. The only measure of Christian growth in Christ-likeness is how much we have become like him in terms of value system. Therefore, we must be sure we truly understand what God values. If we misunderstand God's value system, then we misunderstand who he is. If we do not know what God values, then we cannot be sure that we are even becoming like him. How can we know what God values? God has revealed his value system, although many have misunderstood or misrepresented it. Only through an examination of the Gospel of the Kingdom can we know God's value system. We must be very sure we understand the Gospel without adding or subtracting from it, because if we fail to clearly comprehend the teachings of Jesus, we will be severely hindered in knowing and becoming like him. God's value system is sacrificial love for the benefit of others, and it most looks like Jesus on the cross. If we are to be like him, we must understand this truth fully and seek to become like him in loving others sacrificially. God's value system is sacrificial love for the benefit of others, and it most looks like Jesus on the cross. If we are to be like him, we must understand this truth fully and seek to become like him in loving others sacrificially. "This book ... represents the most significant teaching on Christianity that I have had in my adult life." 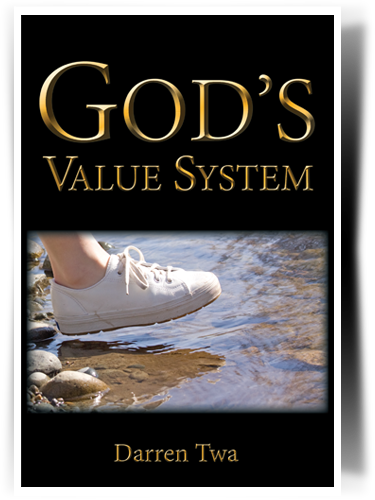 "God's Value System is a great book--one that I will go back over again and again." "I absolutely love it! Great job!! It's really helped me find language and a construct to speak of things that were already within my purview."